I-CAR warned collision repairers Wednesday that many OEMs do not allow repairs on a bumper cover if a blind spot sensor exists behind it. It also noted even bumper cover removal can require a calibration of blind spot sensors under some OEM procedures. “Events that may require a calibration of the sensor include, removal of the sensor, removal of the bumper cover, or damage to mounting locations,” I-CAR wrote. As bumper covers are the most commonly affected items in a collision (68 percent of the time), according to Mitchell data, repairers need to pay extremely close attention to these kinds of OEM requirements as advanced driver assistance technology appears more frequently behind fascias and panels. About 72 percent of those times, the affected bumper covers are replaced, according to Mitchell’s study of a 3 million-estimate subset of the IP’s data. I-CAR also this week released its full SEMA educational lineup, following an earlier announcement about it and SCRS’ SEMA main stage presentations. It plans more than 30 courses or demonstrations during the show Nov. 1-4 at the Las Vegas Convention Center, spread across classrooms, the main stage and I-CAR’s booth, No. 10879. 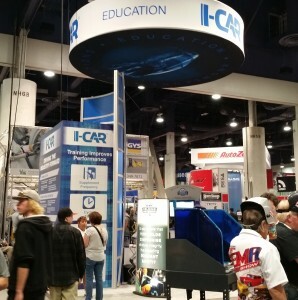 “I-CAR designed the SEMA courses and presentations to help improve collision shop business performance and address changes in technology and materials,” I-CAR curriculum and product development director Josh McFarlin, who will co-teach one of the main stage classes, said in a statement.